We have been supplying sheep shearing equipment, clippers and accessories for over 25 years. Based near Leominster, Herefordshire we supply leading brands of sheep shearing equipment, horse and cattle clippers. The workshop is fully equipped to service, repair and sharpen combs and cutters, with a parts warehouse stocked with the key essentials. 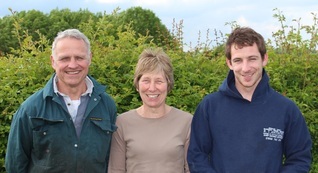 RT Anthony is a family run business with a wealth of experience in livestock clipping and shearing which is demonstrated in the wide range of products and services. Our expertise and experience enables us to offer a personal, practical service as the many of the products we sell have been tried and tested by the team. Our range of brands include Lister, Supershear, Heiniger, Ace Shearing, and our range extends includes Hotline Electric Fencing. With over 25 years of experience in the agricultural industry from shearing to selling equipment, Richard has developed a business based on experience and knowledge of what works well in the field. Feedback from customers helps Richard continue to develop products and services. A key member of the team, Carol manages the customer orders and invoices, and works closely with suppliers to keep stocks up to date. Regular contact with suppliers provides insight into new equipment, which can be tested and featured in the ranges. Freddie is following in his father’s footsteps working within the family business. Having travelled to Australia and New Zealand sheep shearing, Freddie has experienced first hand a wide range of shearing equipment, helping shape the shearing and clipper range sold.